Cardinal Vincent today congratulated Theresa May on her imminent appointment as prime minister. 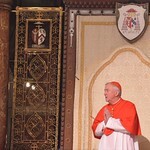 Recognising her judgement, resolve, sense of justice and integrity, Cardinal Nichols assured her of his and the prayers of all Catholics in England and Wales. He also looked forward to working with her across a broad range of issues in the service of the common good. Mrs May has worked closely with the Cardinal, especially on the fight against human trafficking and modern slavery. She attended the first meeting of the Santa Marta Group in the Vatican in 2014, where, in the presence of Pope Francis, police chiefs from over 20 countries committed to working with the Church in combatting human trafficking. Full text of letter below. I write to congratulate you on your becoming leader of the Conservative party, and on your imminent appointment by Her Majesty as our new Prime Minister. I am only too aware of the magnitude of the undertaking you are accepting. I assure you of my prayers and those of the Catholic Community in England and Wales. I am personally delighted at your appointment. I know from the work we have done together that you have so many qualities to bring to the service of our countries at this time. I appreciate the maturity of judgement, the steely resolve, the sense of justice and the personal integrity and warmth you have always shown. I thank you for the remarkable work you have accomplished for the victims of human trafficking, including your strong personal support for the establishment of the Santa Marta Group, demonstrated through your presence at its first meeting in Rome. This is a clear indication not only of your determination to use high political office for the protection of some of the world's most vulnerable people but also of your willingness to work with the Catholic Church at its highest levels. As you take up this new and demanding office of Prime Minister, I assure you of my personal support and I look forward to working with you across a wide range of issues in service of the common good. Cardinal Vincent is pictured with Mrs May at the Santa Marta meeting held in Rome in 2014.